We're having a stretch of unusually dry, mild weather this week, and it's good to be outside. I have a hundred chores to do, but before getting started, I decided go to the local nursery to buy a new pair of gloves. Of course, you know how that is... I found a few more things that needed to come home with me. And here they are, in my little box of winter gardening joy. 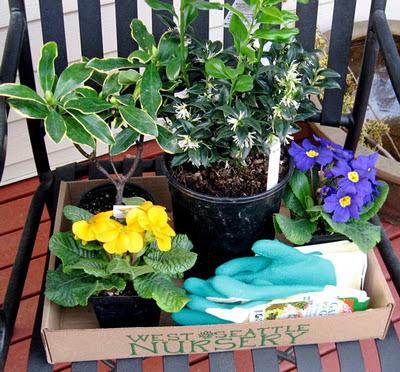 On the left, in back, is a tiny Daphne odora, with scented blooms about to open, which will be a lovely Valentine gift for a friend; next to Daphne is Sarcococca confusa in full, fragrant bloom; in front, on the left, a lightly fragrant, yellow 'Danova' primrose; at right, a purple 'Danova' primrose. And then, of course, there are the gloves which I shall put on now and get to work. Oh, no! It's the Return of the Cone Heads!